Last fall, tort reform advocates busily peddled the FACT Act to lawmakers on Capitol Hill. Meanwhile, a New Hampshire lawmaker took note of the relatively quiet release of a study about cancer among firefighters. The joint study by the National Fire Administration and the National Institute for Occupational Safety and Health (NIOSH) revealed the devastating impact of job-related asbestos exposure on firefighters. It’s also being used to bolster support for a law to fund workers’ compensation for New Hampshire firefighters who have developed mesothelioma and other cancers. The National Fire Administration/NIOSH study was published in the October 2013 issue of Occupational and Environmental Medicine and aimed to clarify whether there is a relationship between occupational exposure and cancer among firefighters. The study examined mortality patterns and cancer incidence among career firefighters and is among the largest of its kind. Researchers looked at a pool of nearly 30,000 firefighters employed in San Francisco, Chicago and Philadelphia between 1950 and 2009. Firefighters’ work exposes them to known and suspected carcinogens like formaldehyde and benzene. The study shows that such exposure is linked to an increased risk of developing certain cancers. The findings were consistent with previous studies which found that firefighters experience higher rates of respiratory, digestive and urinary cancers, compared to the general population. In addition to strengthening evidence from earlier studies, researchers also made a previously unreported finding. They found the rate of mesothelioma among firefighters involved in the study was twice that of the general U.S. population. 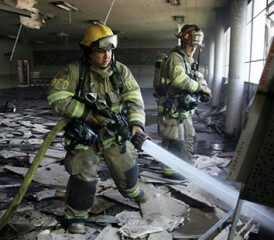 Since asbestos is “the only known causal agent of mesothelioma” and firefighters are often exposed to asbestos in the debris of older buildings, the research suggests an association between firefighters’ occupational exposure and increased mesothelioma rates. Further studies are planned and will look closer at employment histories and use of respiratory protection and ventilation. The study is proving useful in informing the public and promoting cancer risk awareness among firefighters. But it may also help firefighters obtain workers’ compensation. Workers’ compensation reimburses employees who are injured on the job for medical and other costs. But applying for and receiving benefits can be a complicated and time-consuming task. Usually, it also means giving up the right to sue an employer. The amount available for an injury is generally fixed, and many people don’t consider it a significant source of compensation for substantial injuries. However, workers’ compensation can be an important source of assistance for government employees whose ability to sue their employer or otherwise seek compensation through tort litigation may already be limited. State laws determine funding and eligibility for workers’ compensation. In 1987, New Hampshire passed a law that would have provided compensation specifically for firefighters diagnosed with cancer. But the law was ruled unconstitutional. Now, New Hampshire firefighters are hopeful the recent cancer research could breathe new life into the workers’ compensation law. The 1987 New Hampshire law was deemed unconstitutional because it created an unfunded mandate: Paying benefits without establishing a source of funding for the payouts. But New Hampshire Rep. Laura Pantelakos, D-Rockingham; and the Professional Fire Fighters of New Hampshire have seized news of the recent firefighter cancer study as an opportunity to revive the law. Rep. Pantelakos has introduced House Bill 1489, which would create the Firefighters with Heart, Lung, and Cancer Disease Fund. The fund would be used exclusively to reimburse medical and other costs in the workers’ compensation coverage of firefighters. The source of funding would be an annual assessment on insurance carriers and self-insurers. If passed, the assessments would begin after July 2014 in an amount not to exceed 1 percent of all commercial and residential insurance policies for the previous calendar year. Fire Lt. Russ Osgood is among a small group of firefighters who have been raising awareness about cancer risks among Hew Hampshire’s firefighters. He recently told Seacoast Online about the dangers from toxins that are released in the fires he and his colleagues fight. They take precautions such as wearing Self-Contained Breathing Apparatus, but the risks remain and they often don’t know what types of contaminants are present at a fire. If HB 1489 succeeds, they could receive some help. If you or someone you love is a firefighter who has developed mesothelioma or another cancer, Patient Advocates are available to provide resources for medical treatment, workers’ compensation or other financial assistance.